With Permission from Jim V.
Julie Trail is an amazing Doctor of Physical Therapy! I often tell people, “Julie gave me my life back”. After enduring years of lower back pain and seeing numerous neurosurgeons and spine specialists, my primary care doctor finally sent me to Julie. After examining me, she quickly determined that my problem was not my spine but my sacroiliac. After just a few sessions with Julie, I was pain-free for the first time in many years. Thanks to Julie, I had been pain-free for nearly four years—until two weeks ago when I re-injured my sacroiliac. Fortunately, with the help of Google, I was able to track Julie down to her new practice in Greenwood Village. Westminster’s loss is Greenwood Village’s gain but I was more than happy to make the long drive to be treated by the best! Thanks again Julie! With Permission from Ben P.
I suffered a back injury in 1988 and a shoulder injury in 2011. I have received treatments from numerous physical therapists throughout the years. I was fortunate to have made an appointment with Julie in 2008. Because of the excellent treatment I received, I went to her again for the shoulder injury. I maintain that she has the gift of healing. I have experienced the fact that her skills are so refined, that after a short time of working together, she would pinpoint related pains and issues I was experiencing. She would provide me with simple effective exercises and ways to improve my body mechanics. During my painful injuries, she truly minimizes all of the discomfort and pain throughout the entire healing process. Very professional. I recommend Julie without any reservations. With Permission from Georgenne T.
In 2005, I had fallen on my shoulder. In 2008, I had to have rotator cuff surgery, followed by Physical Therapy. I was referred by my Doctors office . I walked in and asked for someone who wouldn’t hurt me and I was assigned to Julie. I swear she has magical hands. After the 6 weeks of therapy, I was able to do things I hadn’t be able to do for years, like raise my arm above my head. I thought that was that until 3 years later when I had to have shoulder surgery again. I went back and asked for Julie because I knew that I was in capable hands. Again, she was amazing and got me back to using my shoulder and arm again. After that, I had knee problems, ankle problems, Migraines and balance problems. She handled them better then all the Doctors I had seen. She has been my savior for years. Professional, personable, and caring are three words that describe Julie Trail, DPT. I have been Julie’s patient for over 10 years. During this time, as I deal with challenging back issues that include a rotating sacrum and disc issues, Julie will customize my treatment to fit the injury. She listens, cares about how I feel, has great attention to detail, and is able to come up with a solution to fix the problem. She also provides on going advice to prevent the injury from reoccurring. She is informative about why injuries can occur based on my daily activities. Knowing this helps me understand what not to do so that I can prevent the injury from reoccurring. Julie is always prepared to have a treatment plan that is tailored to my body. Having superb listening skills, amazing attention to detail, and customized treatments for specific issues is what sets Julie apart from her peers. 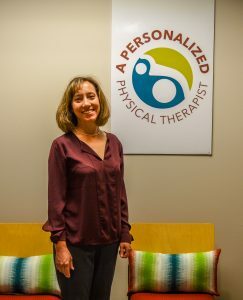 I would recommend Julie to anyone in need of physical therapy! Providing personalized physical therapy treatments focused on gaining and retaining your optimal fitness level.